Once upon a time, the Nissan Maxima was known as the “4-Door Sports Car.” And it was true to some degree. Remember, that was back in the late 1980s, when the stylish and powerful third-generation Maxima counted vehicles like the Buick Century, Mercury Sable, and Oldsmobile Cutlass Ciera as its competition, along with the comparatively dull Toyota Camry. Now, though, lots of similarly sized sedans offer impressive acceleration and capable driving dynamics, just like the 2019 Nissan Maxima still does. Even the equally powerful Camry XSE V6 is a legitimate alternative to the 4DSC. Also, people don’t want sports cars anymore. 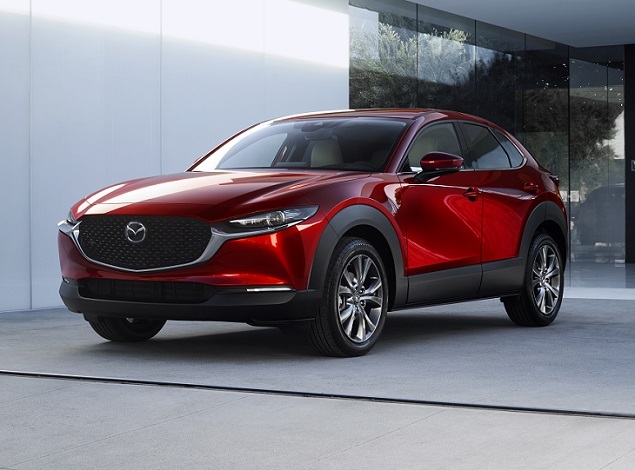 They want sport-utility vehicles, and the Maxima clearly isn’t one of those. Plus, Nissan’s own Altima is just as big as the Maxima inside, and offers impressive acceleration and capable handling in its own right. So where does that leave Nissan’s top-shelf sedan, with a legacy dating back to 1981? For now, according to the automaker, the updated and upgraded 2019 Maxima is an “upper-midsize…aspirational luxury” car aimed at couples and families with older kids. Maxima buyers are people who are “passionate about cars and driving,” and they make almost $100,000 annually. Does the refreshed 2019 Maxima make sense for that type of buyer? A brief drive in the new Platinum Reserve trim level suggests that it might. With 2019’s round of styling changes, the latest Maxima looks better to my eye, though it still carries too much visual weight over its front wheels. Reworked front and rear, the Maxima’s bolder details, such as a larger V-Motion grille and quad-outlet exhaust finishers, deliver the visual punch necessary to match the rest of the car’s rather wild bodywork. New wheel designs, new lighting elements, and a new Sunset Drift Chromaflair paint color round out the changes. Interiors get improved materials and color/trim combinations, especially in SR and Platinum versions of the Maxima. For example, the Maxima SR is available with a new black interior that features perforated Alcantara suede seat inserts with orange accents, faceted Dark Satin trim, and a black headliner. The Maxima Platinum can be optioned with a Platinum Reserve Package that installs the same Rakuda Tan semi-aniline premium leather as is found in the Nissan GT-R, complete with diamond-quilt stitching, a black headliner, and faceted bronze trim. My test car was the Maxima Platinum Reserve, priced in the mid-40s. It looked and felt upscale enough to justify that ask. Plus, the heated and ventilated front seats are mighty comfortable, and the rear seats offer impressive comfort and good legroom. Space for feet is a little tight, though. Trunk space isn’t terribly generous, either, measuring just 14.3 cu.-ft. Longer items can fit, however, thanks to the 60/40-split folding rear seats. Nissan offers the 2019 Maxima in S, SV, SL, SR, and Platinum trim levels, and pricing starts at $34,845 including the $895 destination charge. Standard equipment includes cloth seats with 8-way manual driver’s seat adjustment, a NissanConnect infotainment system with an 8-inch display screen, Apple CarPlay and Android Auto smartphone integration, a new Rear Door Alert function, automatic headlights, automatic emergency braking, and a new driver alertness monitoring system. To get leather seats and a navigation system, you’ll want SV trim. The Maxima SL further installs a Bose premium audio system and a dual-panel sunroof. Get SR trim for a set of gloss black 19-inch aluminum wheel, a sport-tuned suspension, paddle shifters, and a rear spoiler. The SR Premium Package adds 360-degree surround view monitoring with moving object detection, rear automatic braking, and a dual-panel sunroof. Platinum trim equips the Maxima with the SR Premium Package contents plus upgraded leather, heated and ventilated front seats, NissanConnect Services technology, and Nissan Safety Shield 360 systems. To this, the Platinum Reserve adds exclusive semi-aniline Rakuda Tan leather, charcoal-color pillar covers and headliner, heated rear seats, and exclusive 19-inch aluminum wheels. The Maxima might be a midsize car, but it feels intimate from behind the steering wheel. Controls are located at your fingertips, and thanks to clear markings and plenty of buttons and knobs, this is an easy car to drive with a minimum of infotainment screen distraction. 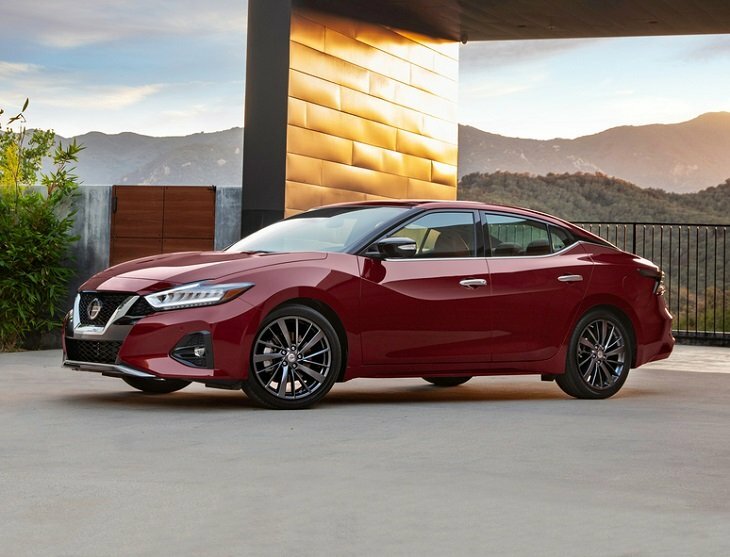 Every 2019 Maxima includes automatic emergency braking, a new driver attention monitoring system, and a new Rear Door Alert system. The Rear Door Alert system is designed to prevent parents and pet owners from accidentally leaving someone important in the back seat. In order to benefit from a blind spot monitoring and rear cross-traffic alert system, you’ll need to upgrade to SL trim. And if you want the Nissan Safety Shield 360 suite of technogies, you’ve got no alternative but to buy the top-of-the-line Maxima Platinum. Nissan Safety Shield 360 equips the Maxima with pedestrian detection, a rear automatic braking system, a lane departure warning system, and automatic high-beam headlights. Nissan also considers its blind spot monitoring and rear cross-traffic alert systems to be a part of this collective group of driver assistance and collision avoidance technologies. What’s not included in Safety Shield 360 is Nissan’s frequently touted ProPilot Assist system. 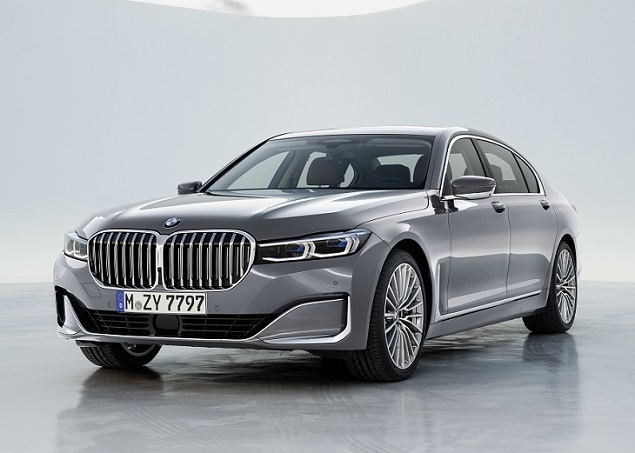 It maintains proper following distances to traffic ahead, and features a lane centering assist system designed to reduce fatigue on long drives. The Maxima seems like a natural fit for such technology, but it’s not available on this car. You’ll need to get the redesigned 2019 Altima if you want it. As far as infotainment technology goes, the standard NissanConnect system is easy to use. This year, it gains a USB-C fast-charging port, Google Assistant integration, added to Amazon Alexa capability that carries over from before. “Over the air” software updates are available, and the navigation system now offers a “door-to-door” function that continues directions via smartphone if you’ve needed to park several blocks from your destination. Equipped with a delightful 3.5-liter V6 engine making 300 horsepower, the Maxima is made to perform. The problem is that a continuously variable transmission routes the power to the front wheels, and that’s not ideal. Tromp hard on the car’s accelerator, and the nose darts this way and that as the Maxima struggles to overcome torque steer and gather velocity. This is a quick car, but it’s begging for an all-wheel-drive system. Remarkably, the CVT isn’t irritating. 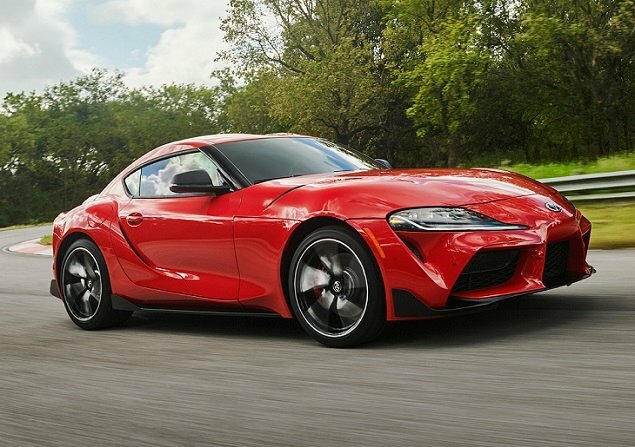 It has a manual driving mode with intuitive shifting, but if you want paddle shifters for the steering wheel you’ll need to get the SR trim. That makes little sense to me. If you’re going to tout GT-R sports car heritage with the Platinum Reserve package, you’d better expect Nissan fans that love to drive to spend the extra money for it. And guess what? They’re gonna want paddle shifters. I did, anyway. Bombing down a writhing road just to the east of coastal California’s Bodega Bay region, I went to grab a downshift or two and…nothing. With its 19-inch wheels and 4DSC mission, the Maxima Platinum should have the paddles. Steering effort is heavy in this car, perhaps not a surprise given all of the weight over the front end. At least the Maxima’s owner will expect this trait, making it easier to accept. The ride is firm but not uncomfortable, and the car handles in an entertaining fashion. The front suspension has trouble attenuating sharper bumps and dips, though, allowing them to reverberate through the car’s structure. Fuel economy came in at 25.6 mpg over 37.7 miles of driving at an average speed of 34 mph. That aligns well with last year’s EPA rating of 25 mpg in combined driving. The 2019 Nissan Maxima is a better car, but this refresh might also be the last one in a long history of 4-door sports cars. It’s easy to imagine the run culminating with a 2021 Maxima 40th Anniversary Edition. Simply put, Nissan just doesn’t need the Maxima anymore. The redesigned 2019 Altima looks similar to it, is more technologically sophisticated, and is fairly rewarding to drive with its standard 2.5-liter 4-cylinder let alone its available variable-compression turbocharged 4-cylinder engine. That leaves extroverted exterior design, a high-quality driver-oriented cockpit, and one of the best V6 engines ever engineered as the Maxima’s main selling points. And that’s not enough.